Aside | This entry was posted in Holidays, Parenting, Uncategorized, Women, Working Mom and tagged Afghanistan, homefront, Veterans Day. Bookmark the permalink. 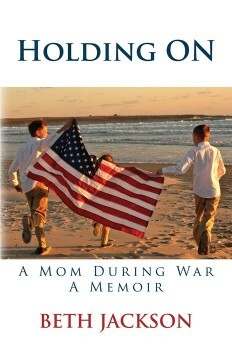 Beth’s book make me realize the impact on my life of my Dad’s service in Vietnam from the perspective a the child in that situation. Having been born on the Army base right before he shipped out and not having him around for my first year is obvious, but more importantly the impact of that war on my family after he returned. It is a necessary and important sacrifice that we as a country should never forget. Let our thanks to all veterans and their families include providing the necessary support during as well as after. Beautiful. I am just realizing myself the sacrifices and struggles our veterans and their families endure. Thanks for sharing Julie! I too felt so alone even though I had family surrounding me. I had so many people telling me, “It will be ok”. I wondered what “ok” meant. I even had a friend tell me “single moms do it everyday”. That didn’t seem to make me feel better either. My life was turned upside down while caring for a 3 yo boy and a 1.5 yo little girl. I think I cried in the shower everyday for about two months. John was gone over a year and our little girl wasn’t talking before he left and was speaking in sentences when he came home. Now I’m not trying to tell a sob story. Just the facts of what we were feeling. We did learn so much, however, by the experience. Our life is richer from it all. I learned to have a little more independence. John was able to experience things he had dreamed of as a little boy playing with his imaginary battalion in the country. That’s so John isn’t it:) We overcame it all and John came home safely. Praise God! I’m so sad to think of the family’s story that didn’t end like ours, though.